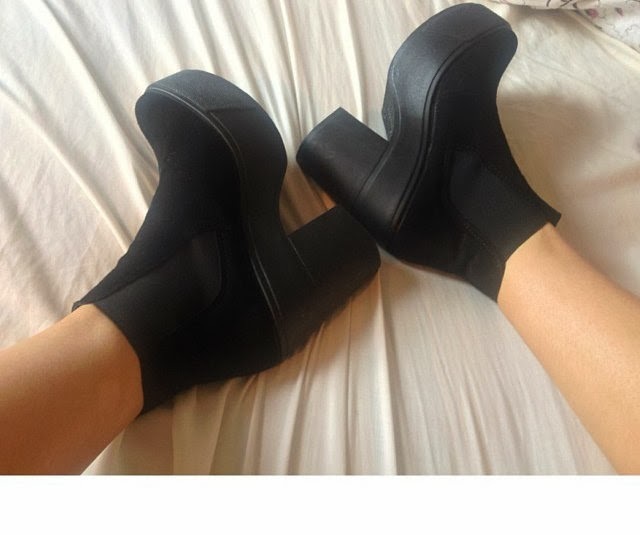 LAURA LOUISE HAYNES: N E W I N | ANNY PLATFORM CHELSEA BOOTS. N E W I N | ANNY PLATFORM CHELSEA BOOTS. Well I tell a lie, I did not exactly purchase these even though I spotted them a few weeks ago online and thought they would be a perfect essential to my wardrobe. I then was entirely shocked (and wondering what he was after) to find my boyfriend had treated me to the following beauty's. I have a good one. Clumpy, black and comfy, what more do you want in a boot? Thanks Topshop and my boyfriend! Ah they're beautiful! Your boyfriend did good! These look really good on you Laura!